The 22nd edition of Montreal's Fantasia International Film Festival was the site for the world premiere of Robert D. Krzykowski's THE MAN WHO KILLED HITLER AND THEN THE BIGFOOT on July 20th, 2018. The film has easily one of the best titles I've seen in years and somehow manages to subvert the expectations of a name like that and deliver something far more interesting and sober. Calvin Barr (Elliot) is a legendary World War II veteran who has the distinction of being the man who secretly assassinated Adolf Hitler. An act that has left him with remorse and regret. He quite possibly saved millions of lives but he killed a man, no matter how justified, at the end of the day he still carries the weight of that one moment. Killing Hitler forever changed the course of history and in turn destroyed his life. As we meet Calvin he is in the twilight of his life and coming to terms with the decisions he has made. Making peace with a life he would not have chosen. In the middle of this process, he gets a visit from the FBI and Royal Canadian Mounted Police. They need him to assassinate another threat to world peace, Bigfoot. It's hard to believe that this is writer/director Robert D. Krzykowski first feature, the film is incredibly accomplished from both a visual and narrative perspective. Having effects by Douglas Trumbull (2001: A SPACE ODYSSEY, BLADE RUNNER) probably goes a long way in giving the film a more mature look. Trumbull also co-produced the film with John Sayles and Lucky McKee. Yes, this weird little meditation on guilt through the lens of Bigfoot and Hitler has one hell of a pedigree. The film manages to strike a near perfect balance between the comedic/action/horror moments that you might expect from a film with a title like this and the genuine pathos that Elliot brings to the role. Elliot manages to create a grounded, deeply empathetic character that exists in a batshit crazy world. Krzykowski skillfully weaves those two worlds together and manages to make them compliment one another. In lesser hands, the shifting tones and genres would be jarring but Krzykowski moves between them with grace and confidence. 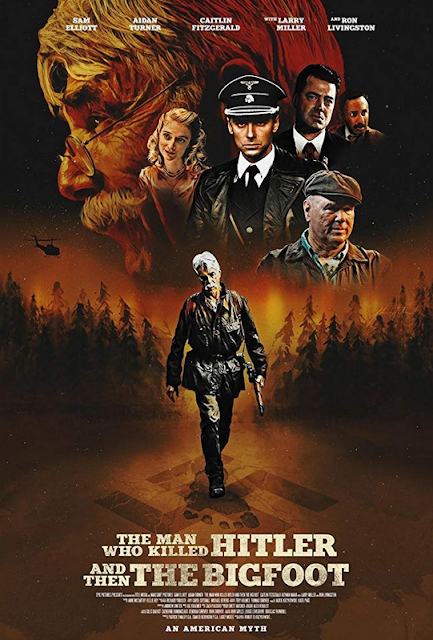 A surprisingly poignant take on old age THE MAN WHO KILLED HITLER AND THEN THE BIGFOOT is one of the most strikingly original films to have screened at this year's Fantasia. While viewers will undoubtedly go into this expecting an exploitation riff on WW2 and monster movies, if they are open to it, they might get something they need instead of something they thought they wanted.